My results are above what I thought possible. My 11's are just pale lines.... not wrinkles. I'm now working on my hypertrophic burn scars. I'm taking photos this time because of my facial results. 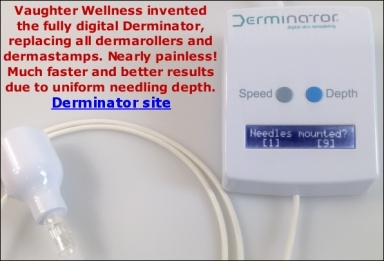 Did you use single needling or just a dermaroller on your 11s? I started with just dermarolling but last 6 months-ish I combine it with single needeling. The only area it hasn't worked as well has been a long forehead line. It's improved but not at the rate of others. What is the difference between suctioning wiht medical tape and suctioning with say, a microderm machine? Did you research different ways to suction before you chose medical tape technique? Also, when you single needle your 11s do you go straight into the wrinkle or do you needle on an angle? I did some research before I settled on tape. I purchased small suction cups & a pore cleanser. The pore cleaner didn't have enough suction and cupping left me with bruised dots. So tape worn while I sleep is the best choice for me as suggested in thread. Im having good results, so investing in a micro dermabrasion machine isn't necessary but that is what they used in the article. Sarah would know best about this method but I'd say if u have one go for it. Look up comments by FINELY she's having great results also. She uses saline injections with this method but from memory no suction. I keep uming & areing about doing it myself. But just start gentle, follow Sarah's advise & judge what to do from your skins reactions post treatment. I forgot to thank you for your effort of posting your updates. Everybody here appreciates it. It is great your skin has been improving! Thank you Soon for your effort as well! I'm interested in the suctioning because there was mention of it producing faster results, though I'm not sure if the method can work in conjunction with my method, which is stamping (no single needles...the scars aren't large). I'm wondering if tape can be applied after a regular derma stamping session or if more aggressive single needling must be done in order for there to be any effect? And also, how can tape be used? Is it just applied to the scar immediately afterwards, and if so, for how long? How can tape replace a suction cup, and does it need to be applied a certain way?